additional information about specific grants. Information about our Regular Grants is available on a separate page. Click the title or ► to learn more. No Deadlines. Grant Awards in June and November. Important Note: This IT Capacity-Building Grant Program is separate from, and adjunct to, the Foundation Bi-Annual grant-making schedule. An IT grant will not effect your organization’s request for operating/program funding. The Phoenixville Community Health Foundation has established this mini-grant program to streamline requests for financial assistance towards the purchase of an Automatic External Defibrillator. AED Mini Grant Application Packet No deadline, Submit at any time. An ongoing mini-grant program for teachers, nurses, other in-school professionals and non-profit organizations serving youth and families. 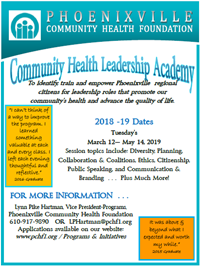 Designed to introduce innovative teaching techniques and educational opportunities that will enhance the health-related learning experience and healthy life-style options for at-risk youth and their families in the greater Phoenixville area. No deadline, Submit at any time. An ongoing mini-grant program for non-profit organizations serving the greater Phoenixville region. Intended to assist non-profit boards of directors with training and educational programs that strengthen the governance structure and program accountability. This mini-grant can be applied for by NCCFCA member fire companies in good standing and the Phoenixville Water Rescue Team. It is designed to offset the cost of fire-fighting and safety training opportunities that are not offered/available through the Chester County Public Safety Training Center. Grant awards not to exceed $2000.